Some kitchen tools stay stuck in a drawer and only see the light of day twice a year, but others almost never get put away because they’re so necessary. There are 5 items in my kitchen that I don’t think I could do without: they’re necessary for my dinner prep almost every night and get put back into use the second I wash them. Here’s my star kitchen team. 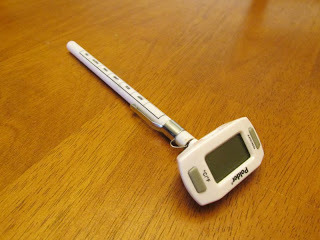 I don’t know how I ever cooked meat before a digital meat thermometer came into my life. I switch it on, pull off the cover, and stab it into my teriyaki pork loin to see if it’s done yet. My previous technique was to stab meat and see if anything pink came out, and then decide that either way, another few minutes would probably be smart. Let’s just say I cooked with a lot of gravy in the old days. 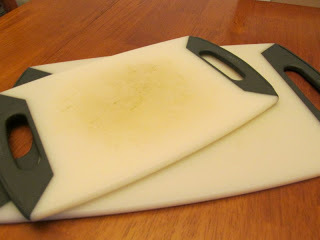 I use these cutting boards pretty much daily. They’re stained from years of use, but they’re sturdy and easy to sanitize. They’re grippy enough that they don’t slide around the counter, which is a big plus when you’re trying to chop onions on them with a huge sharp knife. Mom admired them when she came to visit, so she went home with a set of her own. 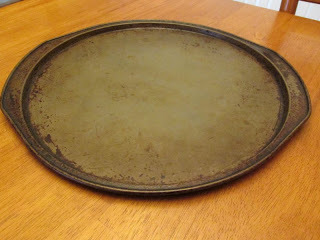 Sometimes, I actually use this for pizza. Far more often, I use it for roasting veggies. A pizza pan is the perfect size to hold a couple of chopped potatoes and an onion that I’ve tossed in olive oil and spices, and the little edge keeps anything from rolling away. I also use it to bake frozen pierogies and to broil garlic bread. I use it as a drip catcher when I’m making pies or a baked pasta. It has looked like hell for a very long time, despite my attempts to make it shiny again, and I’m okay with that. It does its job well and never complains. 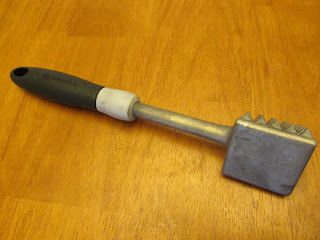 This hammer thing has two “tenderizer” sides I very rarely use, but the flat pounding side has been a miracle tool for me when it comes to cooking chicken breasts. If I flatten them so they’re uniform, I can cook them evenly and they don’t dry out! I can’t explain why it took me years to come to that revelation. 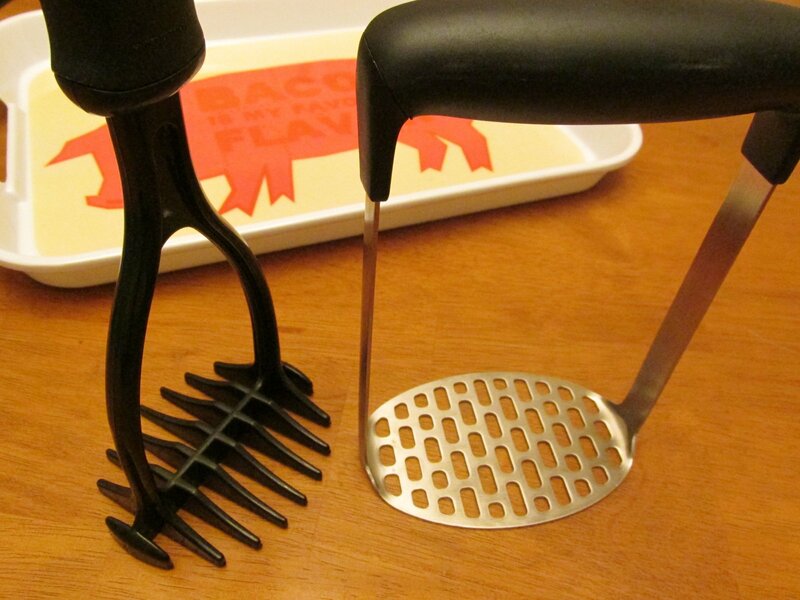 These days, if I’m cooking chicken breasts or pork chops in the frying pan, I’m beating them to hell with this thing first. It’s so much fun to smash things. I picked this little KitchenAid saucepan up to replace a small saucepan that had sprung a leak at its handle. 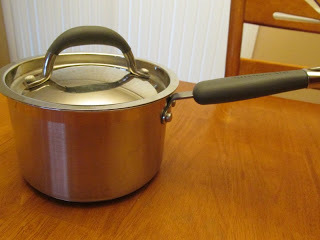 It’s a nice heavy weight without being burdensome, and the rubbery handle doesn’t get too hot to touch. I love this thing because it’s exactly the right size. I always make rice in it. I cook veggies in it. I empty a jar of marinara into it and then dump in frozen meatballs to simmer them in the sauce. On the days I’m lazy and resort to those salty, convenient “noodle sides” packages, this is exactly the right size for them. Many months ago, I prodded my friend Tasha to tackle that question, so she told me all about which tools she uses all the time, and which gadgets she regrets ever taking home from the store. What about you, readers? What’s in a regular enough rotation in your kitchen that you’d have to cancel dinner if it went missing? This entry was posted in Food, Thoughts & Opinions and tagged kitchen gear, list post, stuff you need on April 12, 2013 by antijen.